Thanks Debi. I came back late from a meeting, and just caught sight of this moon over the Tweed, so rushed into the house and got my camera. 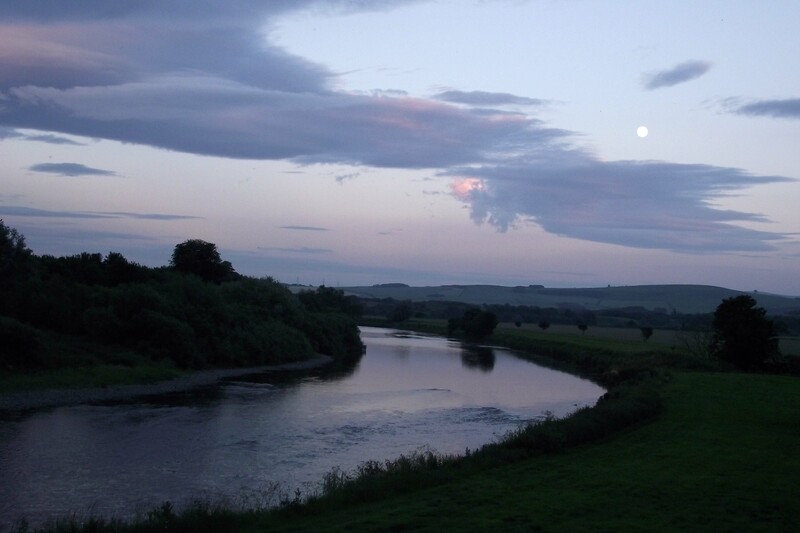 I have taken a lot of views of this angle of the river (just a few moments walk away from where I live), and not liked many of them, but I think in this one the colours of the sky and the placing of the moon made it more satisfactory. It is lovely that you liked it. And like me you like your colours! some times, good fortune and blessings just Happen upon us when least expected. this was such a beautiful moment in time to capture. Thanks, Debi. I am glad I had the nous to run in and get my camera. I don’t think I’ve ever thought about framing my photographs, I suppose because my professional life has been to do with illustration work and writing for children, and taking photographs is something different. The wonderful thing about having a blog is sharing my walks, and communicating with people. I am really behindhand at looking at other blogs, which is something I enjoy doing, because I am working most of my spare hours in the studio on a picture book; but I am looking forward to catching up once these illustrations are finished. I’m real new to web/blog and make tons of errors. +there’s “web etiquette,” never had a clue! oops lol anyway, after years of looking at others’ art images – when I see some nice framable ones, I just Jump In and say so! I love your blog, with all the countryside roaming about – its very natural. I could be there, walking those forest paths too. thanks! I still don’#t knw anything about “web etiquette” – maybe I should look it up! there’s all sorts of rules apparently ! i read you not supposed to say thank you, more than once or twice, as ‘it gets boring’…. ?! what happened to good manners 🙂 its actually kind of funny. Thanks, Mary. I came back late and caught sight of this moon so rushed into the house and got my camera. It was a different view of the Tweed. it was nearly ten o’clock when I took the photograph, the nights are still very light round here, though sadly we are leaving the longest days behind.